This page would optionally be password protected for the Groomsmen only. This is only an example for Demo purposes. I'll post the tuxido rental info here, and any other info you guys might need. Feel free to post any questions bout the rental and the bachelor party! I'll give you guys my ideas, but you can only use them as suggestions, I'll look forward to anything that you guys plan out. This is the look I'm shooting for..... j/k! But if you want to find out the real look, you better get to the tux rental and get measured! Now that the girls settle on the final color scheme, we're good to go. 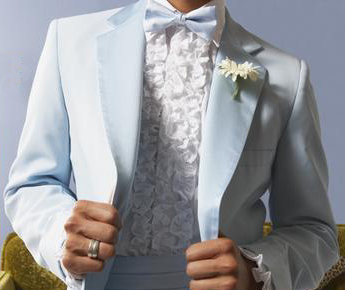 I have chosen the following contemporary style for our Tuxedo. Please go and get measured no later than 2 months before the wedding!